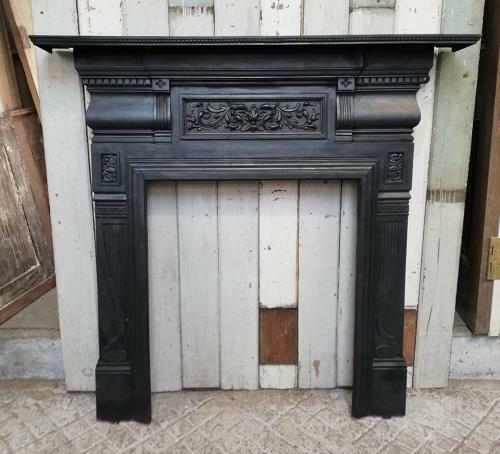 A very pretty, decorative, Victorian cast iron fire surround suitable for pairing with a wood burner or fire basket. The surround is of a good size and would be ideal for a living or dining room. There is a registered design number at the back of the fire, RD254012, dating it to 1895. The fire has been stripped, blacked and polished and has an attractive finish. The fire has a beautiful design, typical of the era, with an acanthus leaf pattern in a central panel below the mantel. There is a rope border around the mantel and the fire opening has a moulded edge that projects out from the fire. The fire, when mounted to the wall, has a gap between the fire and wall. The gap is approximately 4.5cm and would need packing with stone or slate when installed. The fire has fixing lugs at the back of the mantel but is missing one side fixing lug. The fire is antique and therefore has some slight signs of wear and damage due to age. There is a break to one corner of the fire opening, which can be seen, but we believe the fire is structurally sound. We could repair the break for an extra charge but the repair would be visible. Please contact us for details if a repair is required. There are some casting marks, scratches and light knocks. The back has surface rust as expected. The fire has a wonderful design and is of a good size. The fire surround would add fantastic period detail to a home.